With her perfect combination of romance and playfulness, you're sure to fall in love with the Tristan. 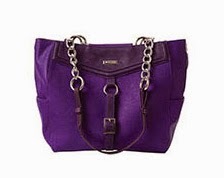 Textured faux leather in deep orchid features a smooth angled collar in even deeper royal purple. Front strap with buckle detailing along with a roomy zippered pocket on the back finish this fabulous look. With side pockets.